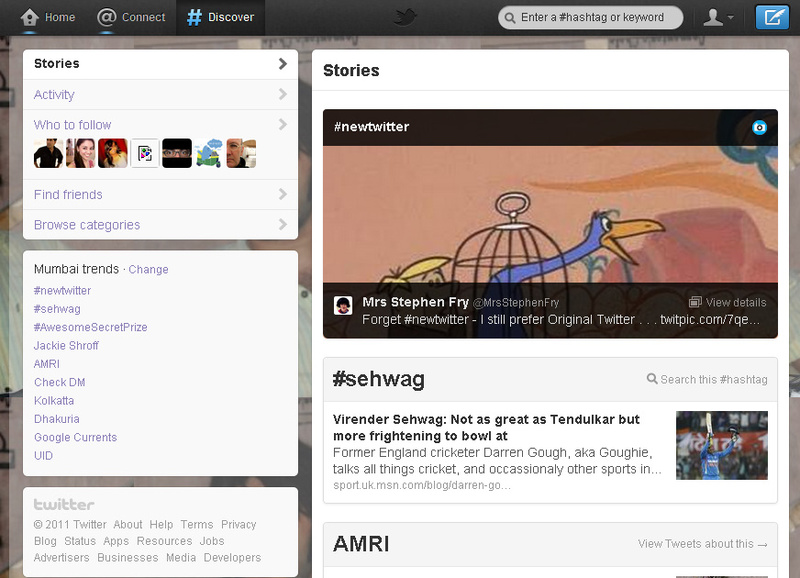 How to get #NewTwitter : What do you think about it? #NewTwitter – Will it really let you fly? Twitter changed again… But hey, wait, didn’t twitter only recently change? With the @handlename & Activity thing. Well it has changed again so welcome to #newtwitter If you haven’t already seen this video, then this is something you’d love to see. The first impression I got, when I looked at the video… Is twitter going the Apple way? You gotta have a look at the video and you’d be able to make a comment on that. I’m sure by the time I’ve written this post, most of you must have already seen the video. If not, then I’d suggest you do and tell me what you think? The real question that went through my mind was… ‘How is the actual interface?’ Does it really deliver what it promises? Will it evolve / change soon enough? I didn’t immediately get the web interface, so I tried it first on my Android phone, which was readily available. Some were a surprised especially since twitter had changed it’s interface a while ago and wondered what changed now? Some were saying that it is going the Apple way, just an extension of twitter for iPhone. 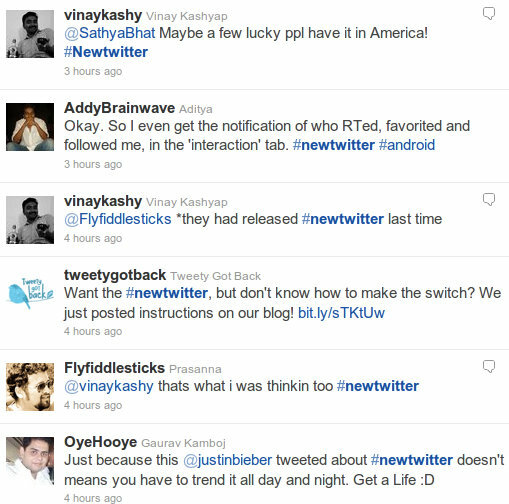 While some were sharing articles on features of NewTwitter via sites in U.S others were of the opinion that, just like everyone got used to the changes earlier they will get used to #newtwitter as well. So, much so, even some of the brands in India hopped on to the conversation and were keen to know what people felt, or had a thing or two to say about #newtwitter. 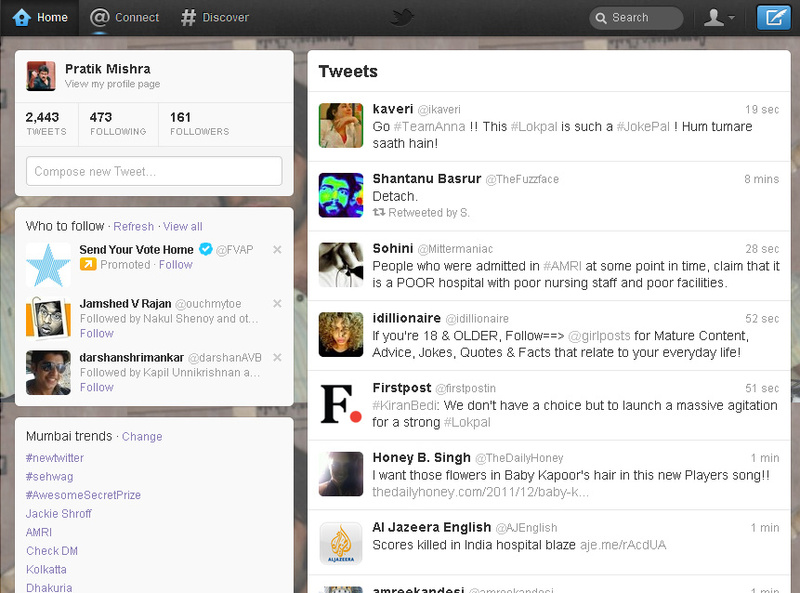 Now, coming back to what I feel about the #newtwitter. 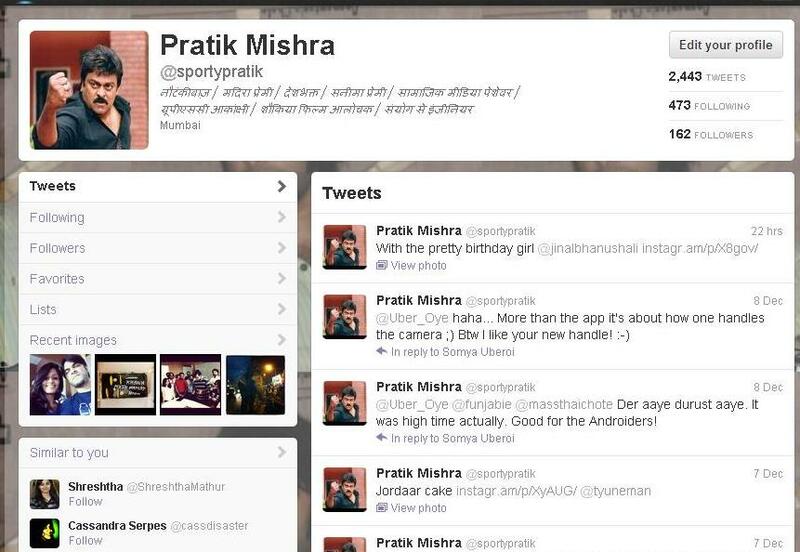 Thankfully one of my colleagues @sportypratik got the #newtwitter giving me the opportunity to try it besides on my phone. @Connect: The new @mention now is @connect. From changing to @mention to @handlename, they’ve changed it to @connect. Basically all your interactions that will connect you to other people will be consolidated here. Easier stuff, not too many things to remember, most importantly intutive. Whoever follows, retweets, mentions, favorites your tweets… all in one bucket to help you connect to your followers. @Discover: Now have a seperate button for searching stuff, instead of an earlier existing search tab like on a blog / google. @discover as it’s called lets you discover new stories. Again besides the simplification of twitter and the branding to give a recall of the activity that you are doing, it makes it simpler for everyone to just search relevant stories they want to lookup. You can discover stories, Actvity, Who to follow, Find Friends, Browse categories of interests and local/global trends. New ‘Me’ Page: This is exactly what was needed, especially when you look at this page it will give your users a complete profile of what you do, what your interests are, what lists you are following & what your favorites are… Basically a one page to show your followers who you are and what your profile stands for. Your Direct Messages are on your Me page. The New Home Page: As you might have already watched in the video, the home page is made such that the ecosystem of twitter is becoming more closed, and embedded just like Facebook / Google+ which means, you won’t have to go outside twitter if there are links / photos / videos to view them. This ploy is one of the smart ones and was needed for a long time. But does that mean, twitter’s individual identity will now change into just another social network, in the existing bunch? Overall, I certainly liked their branding strategy as it definitely goes with the changes that they have made. ‘Yours to Discover’ A faster, simpler way to stay close to everything you care about. LetsFly: The tweeting feature has included feathers to the bird and of course the link fly.twitter.com says it all doesn’t it? Making your experience better and help you fly higher! These were a few of my thoughts on how #newtwitter looks and feels and it’s relevance to users of twitter. Next I’d write a post on how it has changed for brands and how brands in India can leverage those changes. In the meantime, how many of you already tried the #newtwitter and really think these changes will promise to deliver the way they have branded it? Would love to hear your thoughts. 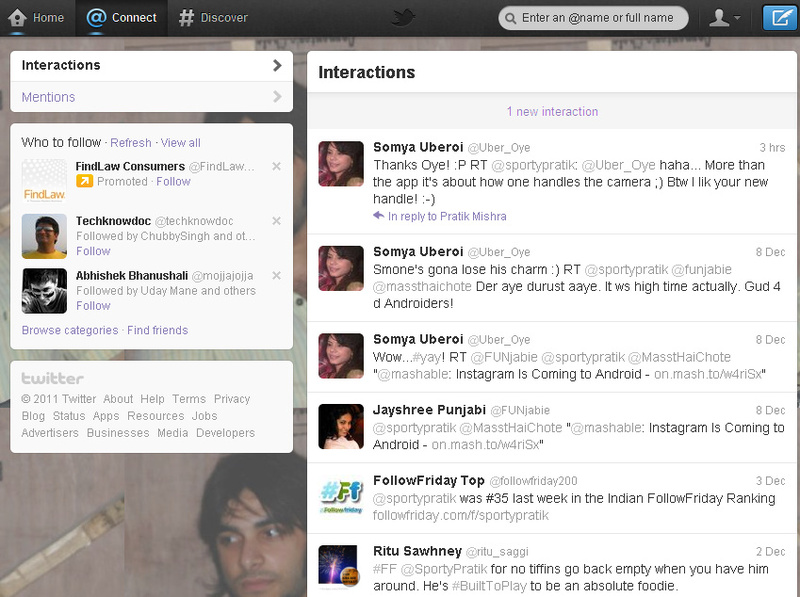 @sportypratik for Lending his handle to do the R&D, especially since I hadn’t got #newtwitter on web.